Wentz meets Philly artist who painted portrait. Rick Williams reports during Action News at Noon on June 14, 2017. PHILADELPHIA (WPVI) -- The Eagles playbook resembles a work of art. From the Philly Special to the Nick Foles-Golden Tate touchdown catch that led the Birds to defeat the Chicago Bears in the Wild Card game, it's a thing of beauty to see for Eagles fans. How the coaching staff draws up the charts could be compared to how an artist uses the brush strokes to create a painting. 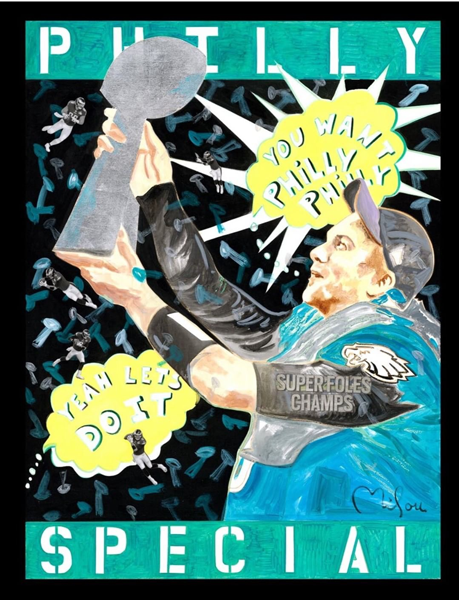 The sports-art metaphor is not lost on some famous painters who have incorporated the Eagles into their latest masterpieces. 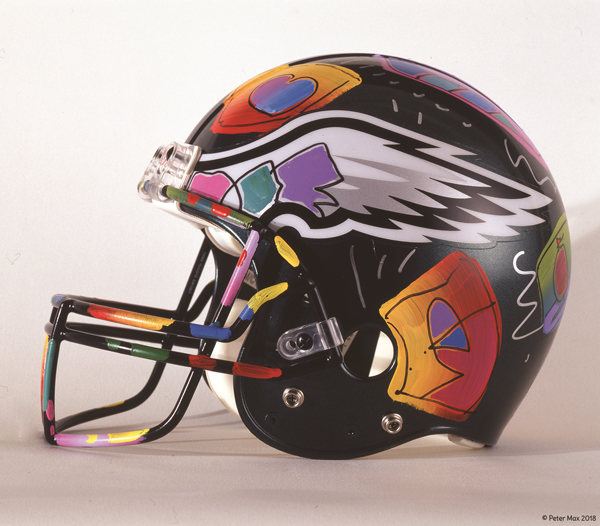 Peter Max, known as 'America's Painter Laureate', has been the official artist for five Super Bowls and has hand-painted unique NFL team helmets and footballs for over 20 years. His version of the Eagles helmet honors their historic Super Bowl LII win last year. Max has an art show coming up on March 2 at Wentworth Gallery in King of Prussia, Pennsylvania. 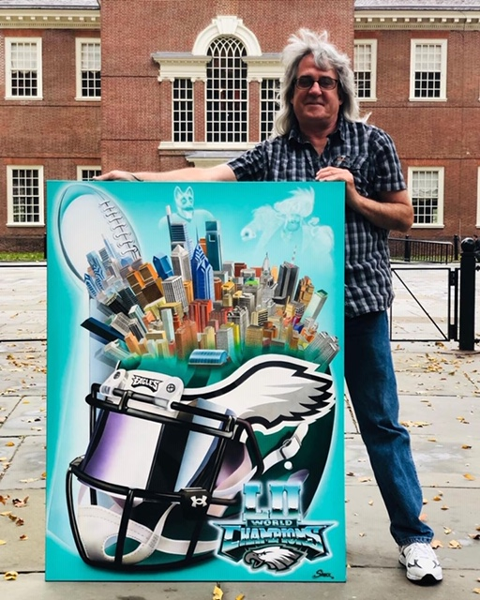 Brett Sauce, a Louisiana native who has lived in the Delaware Valley, drove up to Philly last month to unveil his original piece 'Eagles World.' It's a 48 x 36 work, airbrush acrylic on canvas. 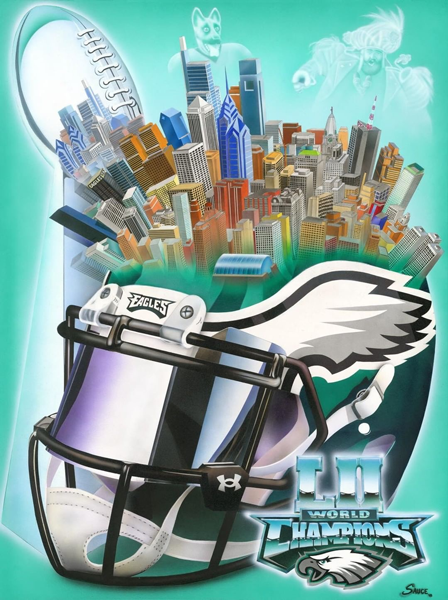 The 'Eagles World' painting was on display at the Nicole Miller store at the Bellevue in Center City and then moved to New Image Art Gallery on Chestnut Street. Locally, Sauce is known for painting the first ever New Year's Day Mummers Parade poster. In the early 2000s, when Sauce was living in Philadelphia he was represented by local pop artist Perry Milou. Milou gained worldwide attention when he was named the official license portrait artist by the World Meeting of Families during the pontiff's visit to America. The lifelong Eagles fan has added two more Birds-inspired works to his collection. 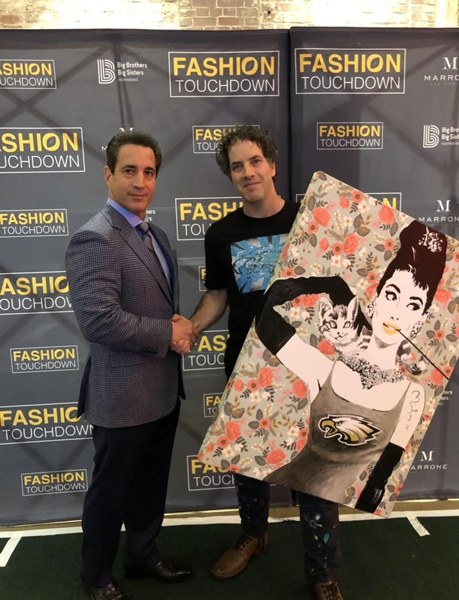 Milou showed off both paintings recently at the Fashion Touchdown event benefiting the Big Brothers Big Sisters Foundation. As for the Heburn painting, Milou says a friend of his has been begging him to paint the Hollywood icon. "After contemplating for a few hours, I said to myself, what if Audrey was an Eagles fan back in the day. Well, I'm not so sure about that, but I am sure that she would be today. Hollywood's who's who are lining up to catch a glimpse of the current Super Bowl Champs. Bradley Cooper sat right next to owner Jeffrey Lurie at the big game," Milou says. And after seeing Milou's 'Carson Wentz' portrait, the Eagles quarterback had to meet the artist for himself. "It was a tremendous honor to present him with my painting, but a greater honor in getting to know each other. I am thankful and blessed. Thank you Carson!" Milou said at the time. And then there's Dan Duffy, who 6abc has documented in the past with his Philly Word Art. 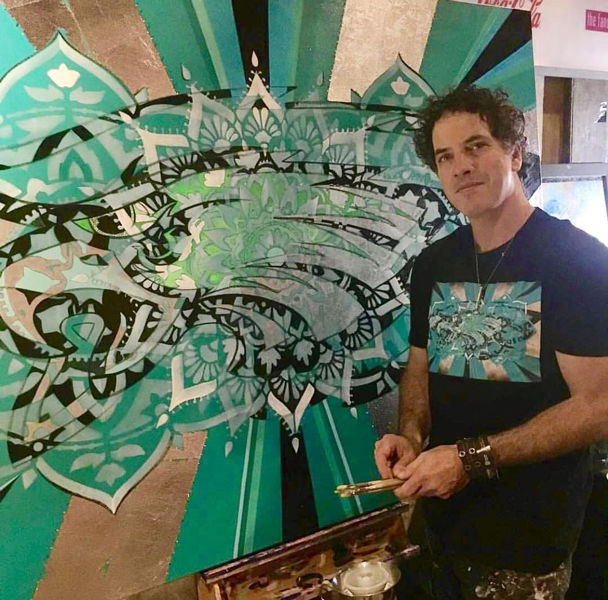 He's created multiple Eagles pieces - as well other Philly sports inspired works - with words, dates, and scores. Philly Word Art opens at King of Prussia Mall. Alicia Vitarelli reports during Action News at 6:30 a.m. on November 12, 2017.